I happened upon Scottish designer Scott Jarvie’s website and his Clutch Project. 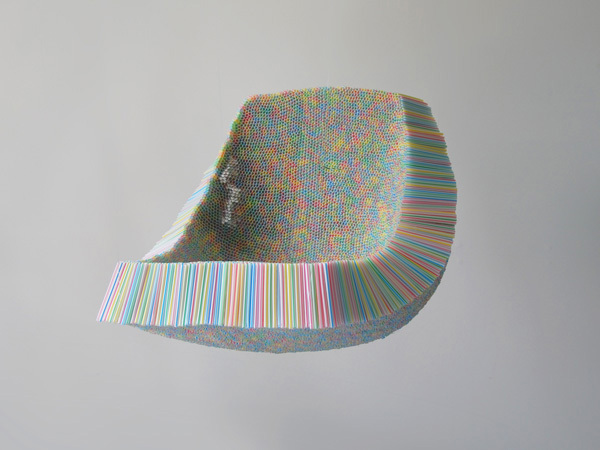 The Clutch Chair is an experimental research project made from 10,000 drinking straws. In the Clutch Lamp, the straws are grouped together and transformed into a spot light. The inner surface of the straws reflect the light in a jewel-like manner creating a unique effect. Instantly reminded me of one of my favorite artists, Tara Donovan’s Haze installation: thousands of clear drinking straws stacked on a wall creating an effect that doesn’t even look like the straws that it’s made up of. You can see more of Scott Jarvie’s interesting work here. This entry was posted in Fun, Industrial Design, Stuff We Like. Bookmark the permalink.